I was recently approached by Anna, PR Coordinator of ExVoto Vintage, about sponsorship and a giveaway for A Blonde Ambition. After taking a quick look at their website, I knew immediately that I had to tell y’all about them. ExVoto Vintage is a collection of one-of-a-kind and limited edition pieces created from antique elements by hand in their Montgomery, AL studio. ExVoto combines vintage lockets and pendants with diamonds, semi-precious stones, Swarovski crystals and more to craft unique, fashion-forward items. 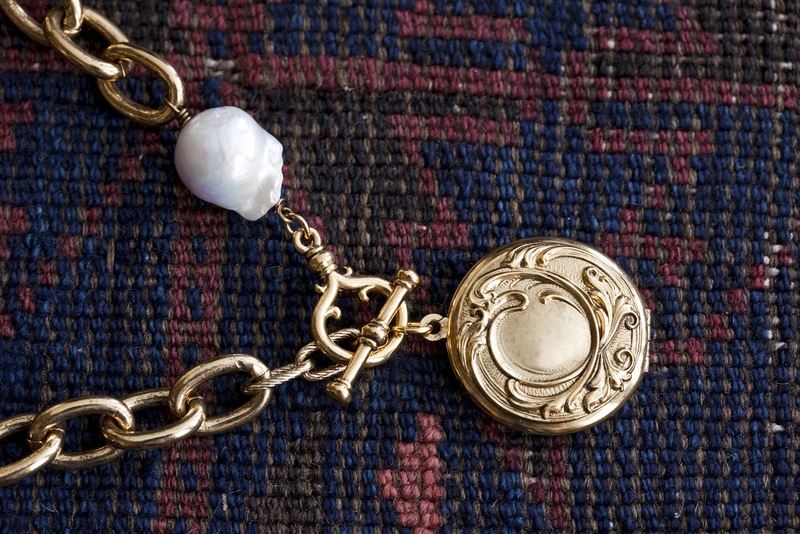 Because of this, the lockets in Elizabeth’s limited collection line for ExVoto Vintage each come holding one of four blessing keepsake charms, just as her first did. Check out there Spring 2012 video for a more detailed glimpse at some of the faboosh items! One lucky winner will receive the stunning Ellie necklace with the Art Nouveau locket, pictured below. *The Ellie Necklace features 18’ of 18kt gold-plated, chunky cable chain and a hand-wrapped, baroque freshwater pearl in white with exclusive ExVoto Vintage toggle closure at the front. *The Art Nouveau locket is created especially for ExVoto with the original tooling that made this same locket, decades ago. 2. 2. Visit their website and tell me, (besides of course the locket), what other piece you’d like to someday own. Don’t wait, girls! Go check out their FB page and website for more gorgeousness, today! I would choose a wrap bracelet! So cute! So so cute! I liked their facebook page! I love both the Ellie bracelet and the wrap leather bracelet! Its all wonderful! Leslie, thank you for sharing ExVoto. I am loving their unique jewelry. So beautiful! My favorite piece so far (aside from the adorbs Ellie necklace) is the Graham necklace in turquoise and gold. So pretty. And I love that you can pick the locket type for almost all of their pieces. So neat! I love the Ellie bracelet and the Classic Sterling Silver bracelet. I also adore their Blessing Charms...esp. love the "All is Well" one! They have such unique and wonderful pieces! i went to their Facebook page and looked at it and LIKED it as well!! Ooooh, I love the 18" Classic in sterling silver! I also like ExVoto on facebook! I'm loving the 21” Wrapping leather bracelet in natural and gold with quatrafoil detail - I would wear it daily!! Loved all their items, but the 33" Graham in turquoise and gold was my fave! Um, I LOVE that necklace up for the giveaway. LOVE LOVE. I've liked their facebook page and would be thrilled to someday own one of those fabulous wrap bracelets someday. I do love the vintage necklaces as well. They're all so unique looking! And love that they're all gold. I wear gold a LOT more than silver. My favorite piece is the Ellie bracelet, simple and classic! i liked the exvoto website on Facebook-LOVED the jewelry! i especially loved the 33 in. graham in turquoise and gold, and i loved the wrap bracelets, too! I liked their Facebook page and I love the 21” wrapping leather bracelet in saddle and sapphire with spectator detail! Hi Leslie, I love the 18" Classic in Sterling Silver necklace. So beautiful! Love Love Love...I "liked" their facebook page. I love the layering of their necklaces! 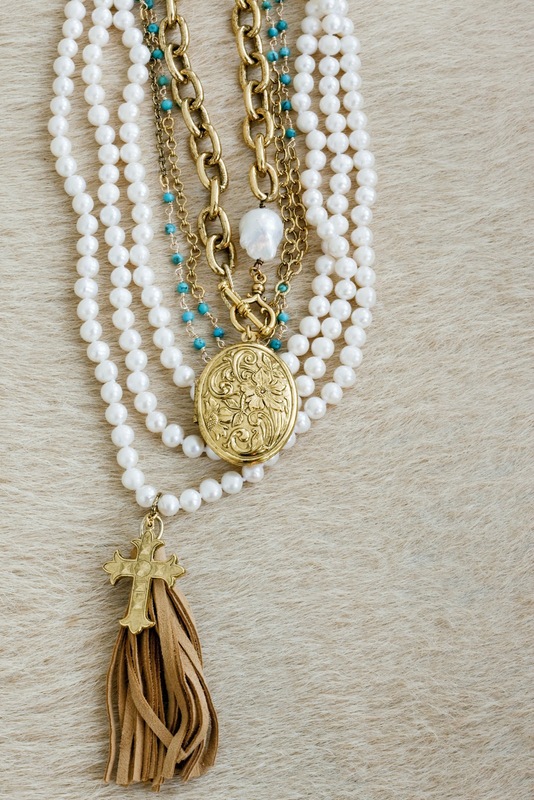 Especially the cross, beaded necklaces & the one with the tassels :) gorgeous jewels!!! Graham in pearl in gold! mix of sugar and spice! pearls/gold! i love everything but the gigi necklace is really pretty! I love the Maisy necklace and bracelet!!! I love the 8" Graham Bracelet!! Thank you for intrducing us to this unique jewelry!! I liked them on FB! I love the Maisy necklace!! 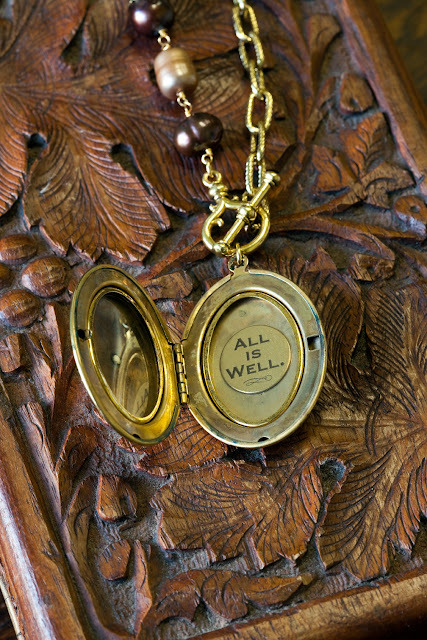 I love the "All is Well" locket in your post! My favorite hymn is "It is Well With My Soul" so that necklace is perfection to me! I "liked" them! I loooove the natural and gold wrapping leather bracelet! As for which piece of theirs I'd kill to own, that'd be the 18" Classic in Sterling Silver! I love the Graham in Amethyst and Sterling Silver! I 'like' them on Facebook! I liked ExVoto on fb and I like the Graham Braclet. thanks for the chance. Love Love Love the Ellie bracelet. I love love LOVE the 21" wrapped leather bracelet with natural and gold with quatrafoil detail! So pretty with the Daisy Locket!! The 33" Gigi necklace is also adorable! I absolutely LOVE their 21” Wrapping leather bracelet in natural and gold with quatrafoil detail! So CUTE! Check out Darling's Fine Things' Facebook page. Lots of new arrivals of Ex Voto Vintage in stock. Ships out promptly. I love their 21” Wrapping leather bracelet in natural and gold and also the Gigi necklace. I also liked their facebook page! I just stalked down that website, i love the beautiful vintage bracelets... The ellie was my favorite. I also like the facebook page... thanks for the giveaway! Well I love it all but my favorite is the Graham in Turquoise and Sterling Silver necklace! Thanks for a fab giveaway! Such beautiful pieces! I love them all but the 33" Gigi Necklace is my fave! I already "like" Ex Voto on facebook... the jewelry is awesome! I have been eyeing it for a while now so great giveaway! I love anything with pearls, so my other choice would be the 33" Graham in Pearl and Gold!! def a wrap bracelet! so cute! !